Green Hill is our city’s leading edge self publishing company. Our authors are located in all parts of Melbourne from Frankston to Cambellfield and right throughout country Victoria. If you are looking to self publish in Melbourne we can help with initial advice through our obligation free consultancy. So how can I publish my book? If you are you a Melbourne author self publishing a book, Green Hill will lead a project team to make sure it becomes a reality. Green Hill will build a team led by an experienced account manager – that’s something you’t won’t get from other book publishers in Melbourne. We will personally assess your project and provide you with the most suitable options to get your project started and on the road to success. Our approach is to lead you through a four step process where we will work together with you to see your project become reality. Green Hill is one of the very few Melbourne publishers ready to project manage your project through the highly effective Self Publishing 4 Bases © project management method. This is the research stage where we gather information for decision making. We ask you about your objectives for the book. Is about turning a profit, the book helping to support other activities e.g. your consultancy or do you have other objectives (which is often the case in self publishing projects like family histories). Elements like you budget and your book publication deadline are also assessed. Of importance is a content review to determine if your manuscript is ready for readers. And now we use our expertise to craft a self publishing solution for you including how the book will be produced and marketed. Will the book be just printed or is a ebook required? How will the book be distributed – through bookshops in Australia, globally or online. Do you need a website and what sort of presence do you have in social media? If you budget is small how can your self publishing be undertaken without breaking the bank? When in production Green Hill involves you with reviewing the quality of work making sure that you are up to date on what’s happening. How do you launch your book onto the market? We advise on a book launch, publicity and your social media presence. We will make sure that your project is professionally distributed not just in Melbourne but throughout Australia and globally by identifying and accessing distribution channels e.g wholesalers, retailers and online marketing services. A key decision – what format will the book take, how will it be printed? Unlike other book publishing companies in Melbourne, Green Hill offers a complete range of services including access to print services in Melbourne, other states and overseas depending on your budget and print requirements. And we are the Melbourne publishing company with expertise in ebook production and getting your new print book into bookshops throughout Australia and worldwide though our distribution networks. How long does the self publishing process take? At Green Hill we are the only Melbourne publisher that will guarantee moving your book quickly from completed manuscript to the printer. This can all happen within just four weeks. 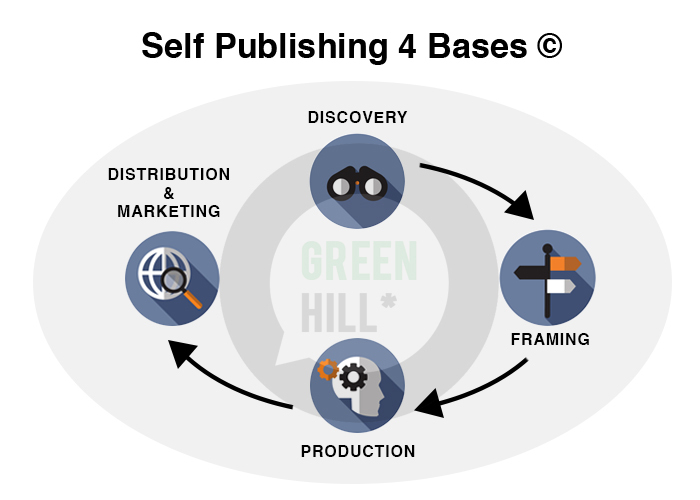 The Discovery and Framing phases takes 1 week, and the Production phase up to 3 weeks providing authors adhere to Green Hill’s achievable predefined schedule. For author’s that have been procrastinating for many years of months, you will be glad when Green Hill moves your project into its production methodology.